We all love Los Angeles, that’s why we live here, but sometimes you just need to escape lala-land for something different. I found myself with a few days off in this first part of 2014, and wanted to escape the traffic and post-holiday depression of real life. I wanted to go somewhere where there was still a hint of winter, somewhere quiet and quaint yet intriguing, perhaps some lights and forgotten holiday decorations. I also wanted to go somewhere different. I’ve exhausted the usual: Palm Springs, Ojai, Santa Barbara. My restlessness inspired me to find a new cozy retreat and to write this piece, sharing three of my favorite secret and unconventional SoCal get-aways. 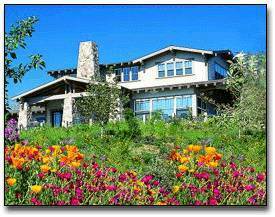 Julian, California and the Orchard Hill Country Inn. Run don’t walk. Although technically it’s a three hour drive. 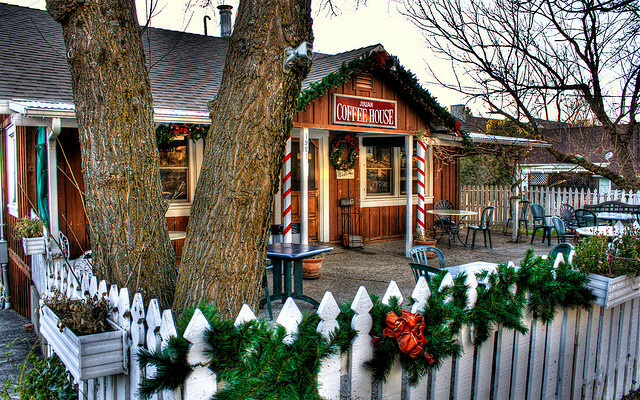 A few years ago, immediately after the holidays, I drove south to this aptly-named “one of the most charming small towns in California” and fell madly in love. 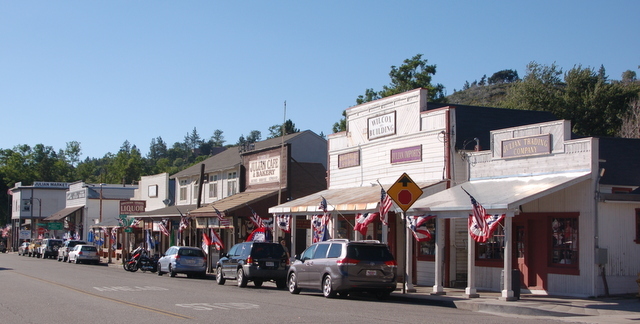 Julian is an old western town with one main street, no billboards, clean air and lots of star-gazing. Famous for its apples, Julian makes apple pies, apple tarts, apple cider, apple salad, apple pancakes and even hard apple cider for those who imbibe. A horse and buggy will take you on a historical tour of the town if you are interested, from fifteen minutes to an hour, whatever you prefer. There are wonderful Mom and Pop stores, like the Birdwatcher and Julian Tea and Cottage Arts, as well as a bookstore, wine tasting room, cowboy apparel store, kids shops and antique alleys. You can eat Barbecue, Chicken Pot Pie, Mexican Cuisine or farm to table, whatever your whim. The absolute best thing about Julian though is the Orchard Hill Country Inn. 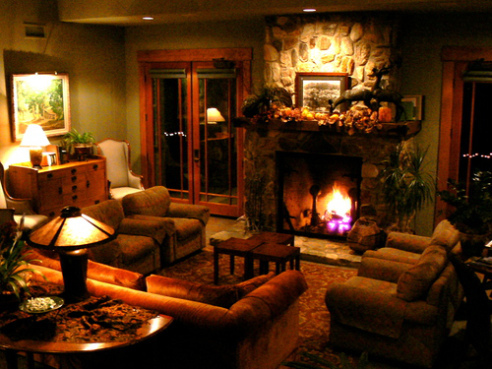 The charming lobby has a roaring fireplace, friendly staff and happy hour every day at 4:30pm. I felt at home the minute I arrived and my stress melted away. It is heaven on earth. They even have a sign outside that reads: “Heaven is under our feet as well as over our heads” – Thoreau. Truer words have never been written. 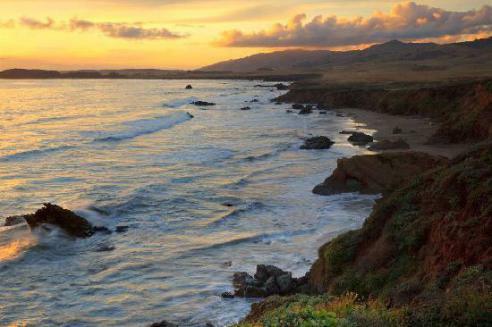 Cambria, California is nestled on the water, near Los Olivos. It’s a four hour drive up the coast but that’s part of the escape itself. A leisurely drive up Highway 1 begins your Cali-cation and the view that we take for granted, the one that others fly hundreds of miles to experience. 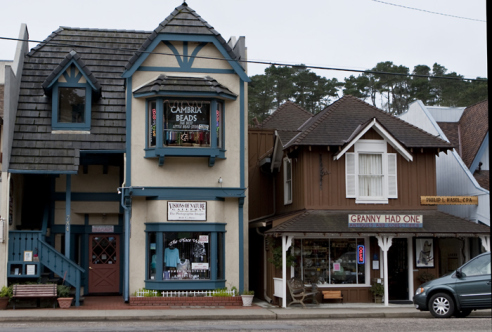 Cambria is caught in a time warp with old buildings and small town smiles. They have places called “The Sow’s Ear”, a rustic restaurant set in an old house and the “Cambria Ale House” where pets, locals and tourists watch sports, sip on beer and wrap themselves in afghans like they’re in their own living room. I stayed at the Squibb House, an old Victorian home turned B&B, with handmade furniture, fireplaces and quaint views of the town. Cambria is a wonderful place to feel completely isolated but if you get restless there are many other sights to see. A thirty minute drive can take you to Paso Robles for wine tasting, the northern coast to watch Elephant Seals lollygag on the beach, or if you really need a jolt, the ornate and decadent Hearst Castle provides shock and awe (and the view of the ocean is astounding as well). I prefer to stay in Cambria though, meandering through the streets, talking to people. I met a carpenter who made beautiful wooden rocking chairs in town and then I sat in one in front of a cafe and sipped tea. I even started to fantasize about living in such a small and relaxing place. Maybe it was the lull and magic of the rocking chair. 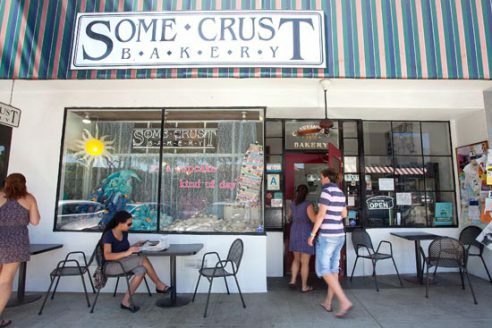 Claremont, California is an oasis in the middle of the Inland Empire. What intrigued me to try Claremont were two things. 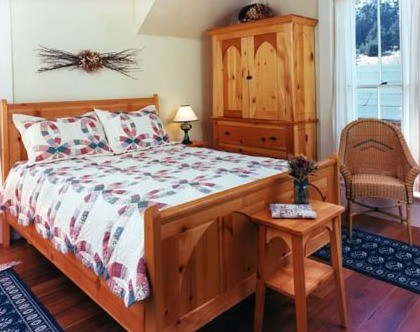 The Casa 425 hotel, a member of the Four Sisters Inns, and the easy 60 minute drive. I wanted to be on vacation fast and I have always trusted the Four Sisters Inns group for including only excellent boutique hotels or B&B’s so I hopped on the 10 and headed east. Casa 425 is very different from a homey B&B, with its modern art and hipster bar in the lobby, but I immediately felt that I was on a retreat somewhere cool. The rooms are spacious, beds delicious and the centerpiece japanese-style sunken tub is a dream. The town of Claremont is adorable. Imagine West 3rd Street or Abbott Kinney before they were taken over by uber-chic “acceptable” chain stores. Rhino Records, A Cat in the Window Antiques, JAX Bicycles, Folk Music Center, Loving Hut Vegan Cuisine … you get the vibe. 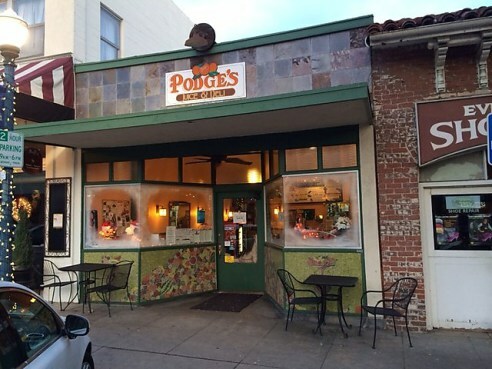 There are dueling sandwich shops, Some Crust Bakery and Podge’s Claremont Juice Company, across the street from each other as well as fine dining at Tutti Mangia Italian Grill. Locals say it’s the best restaurant within fifteen miles. Hard to believe there’s a better place fifteen miles away. 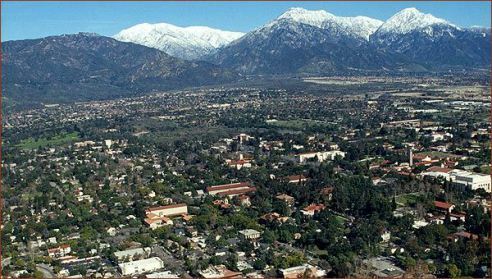 The best part about Claremont is that the people who live there love it and are very proud of their town. Casa 425 has a “Discover Claremont” package which is a steal. You pay $200 for the room and get $100 free credit at any local business so you can peruse the town and take advantage of the wonderful stores and eateries. And peruse I did. In between lounging outside near the fire pit watching football, playing board games on my balcony and soaking in the tub, I toured the town. I felt so content there I even extended my trip. Sometimes it’s hard to really escape from L.A. After all, we are Angelenos and we carry her with us wherever we go. But if you need a place to escape, somewhere to have peace and quiet, write, read, love, explore, eat or contemplate, check out Julian, Cambria or Claremont. They are only a quick drive away. You will return refreshed and charmed, ready for a new year. Learn more about Natalie’s Traveler’s Bookcase in LA and get inspired for your next escape. 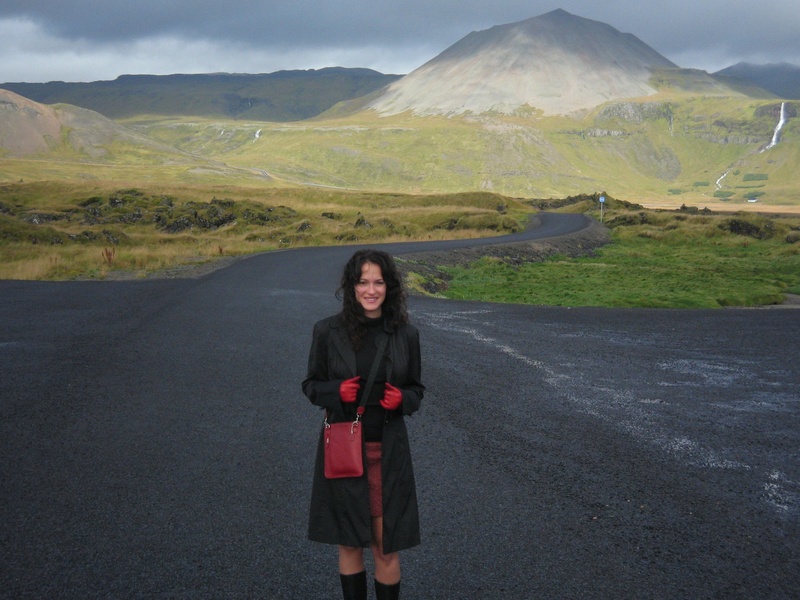 Natalie Compagno has traveled to over eighty countries and writes for numerous international travel publications. She loves living near W. 3rd Street in Los Angeles and has also lived in San Francisco, New York and for a brief, wonderful summer in France. She owns Traveler’s Bookcase, a renowned travel bookstore in Los Angeles, with her husband Greg.